Since the last post, our efforts have been focused on three main aspects: Monitoring P26; gathering as much data as possible about sleep site selection of released individuals; and trialing a method for tracking populations trends and fluctuations in abundance. This is done by keeping track of how much he eats, his weight, when he is active and what he does when he is active. At the moment it varies night by night as to how much he eats, but he feeds fairly early on, before 8pm. He is maintaining a weight of 8kg and his digestive systems appears to be fairly regular! We put up a camera trap at the entrance of his tunnel so we can note when he is active. We also watch him all night once or twice a week, so we can monitor his behaviour for indicators of stress and just get more of an idea about what he is like as an animal. He has not shown any stressed behaviours however, he doesn’t climb as much as the other individuals. This is good to note as it may mean he prefers den sites at ground level, but only time will tell. He often emerges a few times a night, for short periods, but doesn’t seem to be active after 2am. He will be released next Wednesday, so we will keep you updated on how he does. To better understand the requirements of released Sunda Pangolin we have been collecting data about their sleep sites to try and figure out what habitat features may be important. At the moment these are all just general observations from a small number of individuals, but sharing this information is only going to help. 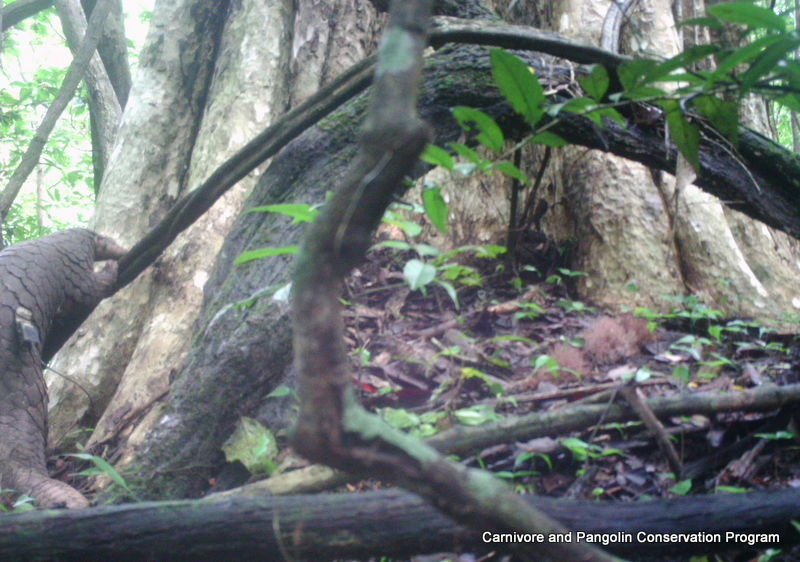 The main factor that stands out is that the released individuals rarely climbed a tree to sleep in the branches, this is in contrast to the wild pangolin tracked where 94% (n=15) his sleep sites were in the branches of the trees. The difference could stem from a preference built up in captivity, where they sleep in an underground den. 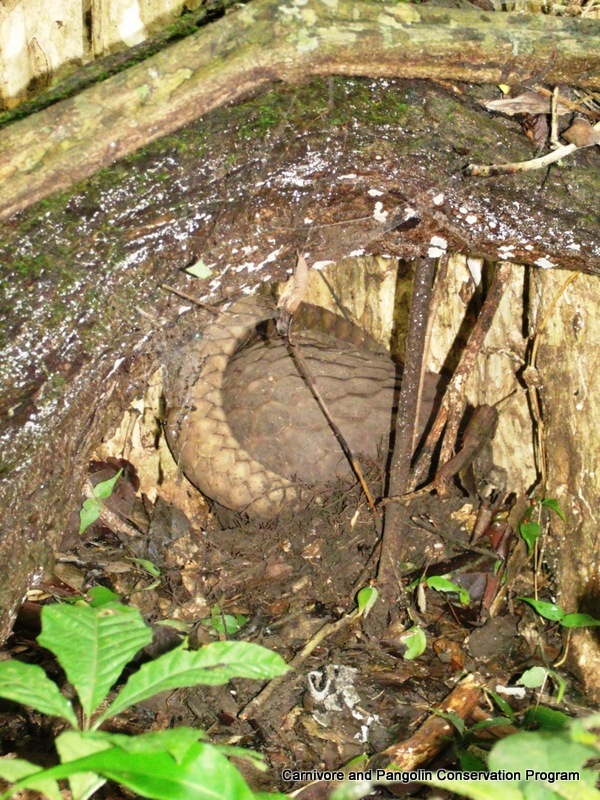 The observations of the wild pangolin could be a result of the extreme historical hunting pressure; if those animals most easily accessible to/spotted by hunters are those in tree hollows and nearer ground maybe the only animals left are those that showed a preference for sleeping high in the branches of the trees, that may have offered a higher level of protection? Who knows. At 92% of sleep sites (n=36) there was a potential source of termites (usually at the base of a tree or in deadwood, rather than free standing mounds). All trees had a trunk circumference of more than 1m. Interestingly, ant nests were harder to locate and yet this is what they are fed in captivity. 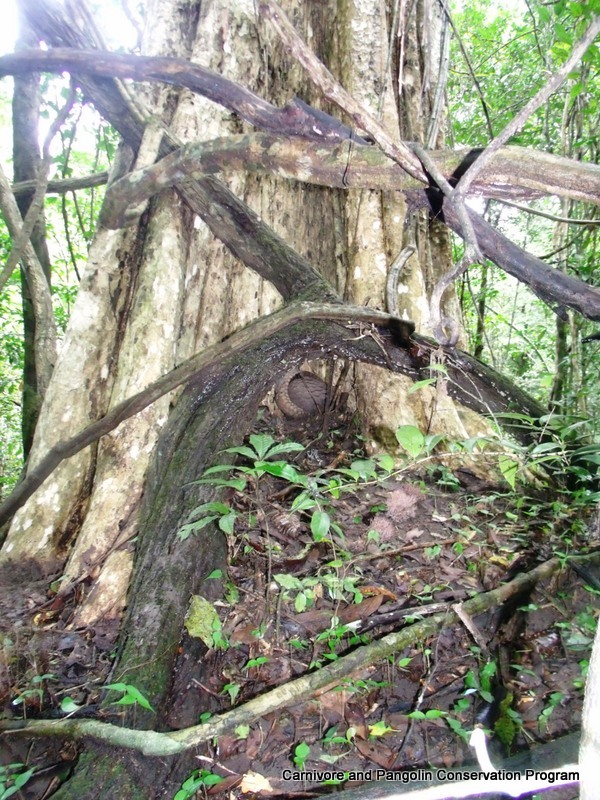 We also took note of the micro habitat; proximity to a water source (or identifying plants that are found in areas where there is a lot of water in the soil); if the area was dominated by Lagerstraemia calyculata (which often have suitable tree hollows); and if the sleep site provided shelter from the rain. Armed with this information we went to random locations within each individual’s range (n=no. of sleep sites for that individual) and noted the presence or absence of features the features recorded at sleep sites (trees with a circumference > 1m; termite mounds; deadwood; tree hollows etc.) with the aim of working out if/what features are statistically important in sleep site selection. 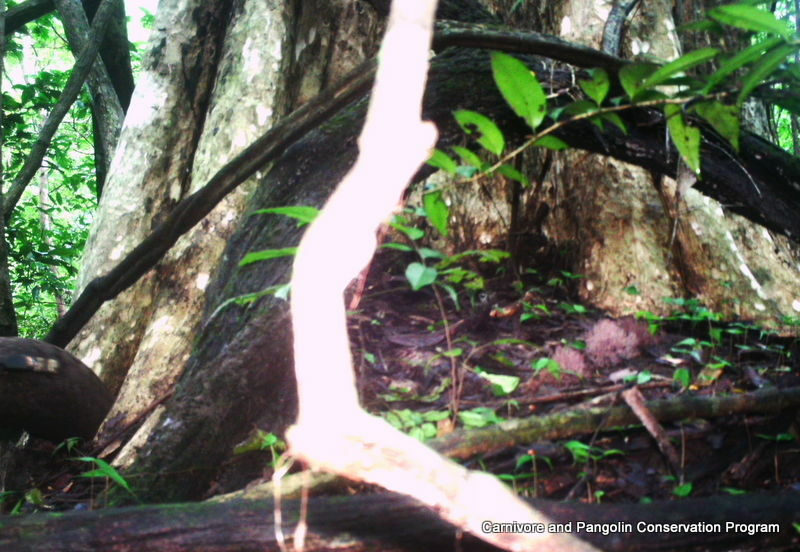 As individual pangolins cannot be identified we have been testing the use of camera traps and the applicability of an occupancy model to estimate abundance, with its potential use to track fluctuations in population (and evaluate the success of a release program). We wanted to trial it as we know that in the area there are at least four individuals (two released and two wild). As it is the dry season, we have also put cameras along the river bed in the sampling area, one at an isolated water source and the others along the dried up bed which provides a clear route to a major water source; it is expected that there will be more animal movement along these routes. Whether successful or not, all this information will help design and refine methods for surveying for Sunda Pangolin in similar habitats. 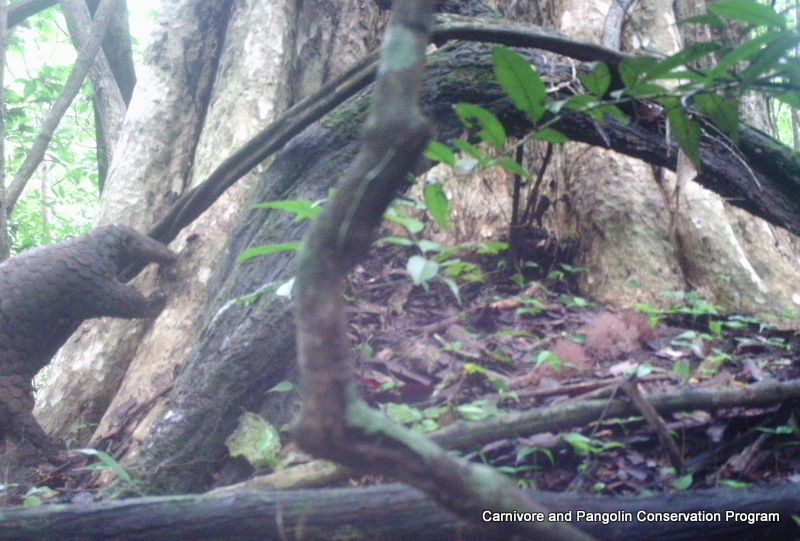 Before we left P27 yesterday morning we set up a camera trap. An hour after we left photographs were taken of him investigating the place where he tried to dig a hollow, before wandering off to his next den site which we found to be inside a dead tree trunk. 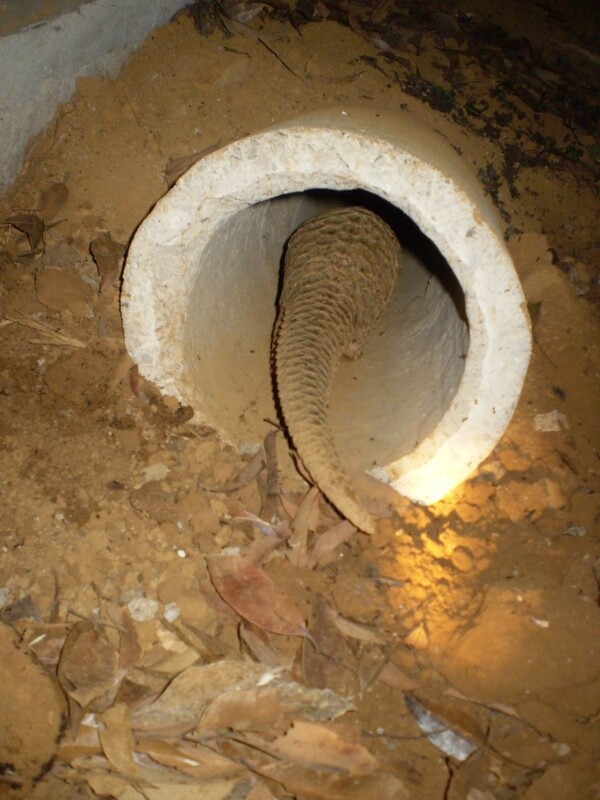 So far in our release program we have seen our pangolins climb up tree trunks and sleep tucked inside tree hollows. However, this morning we found P27 curled up at the base of the tree, after apparently trying to dig a burrow. 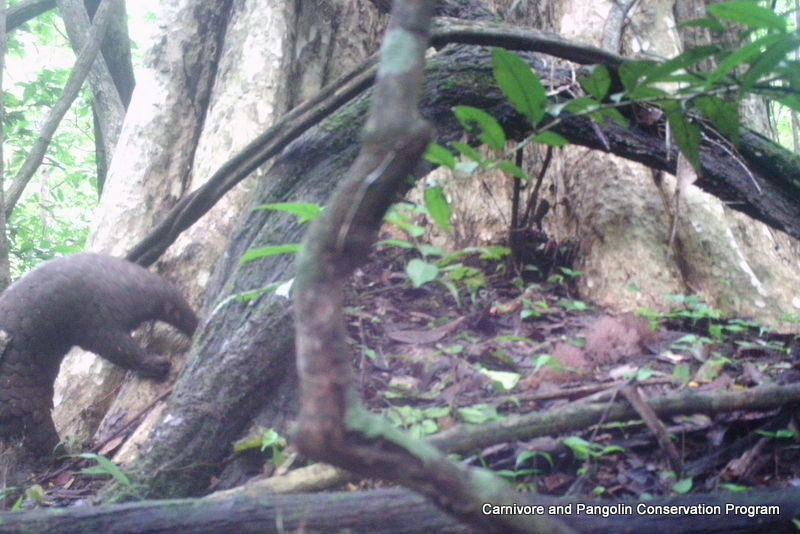 Other species of pangolin are known to dig their own den sites, but Sunda Pangolins are thought of as more arboreal and this certainly matches what we have seen so far. He seemed completely unaware of us being there and remained curled up fast asleep; you can see how easy it would be for a hunter to grab him. With each release we learn something more about the behaviour of these animals and although they may only be small things we observe, it all helps build on our ecological knowledge of this species. In preparation for the next two pangolin releases veterinary staff from Animals Asia Foundation came down to the CPCP centre at Cuc Phuong National Park to attach the transmitter to the next female pangolin (P34) to be released. As well as attaching the transmitter the pangolin had a final health check. This was a very basic check of general condition as a more comprehensive health check had previously been done last year. 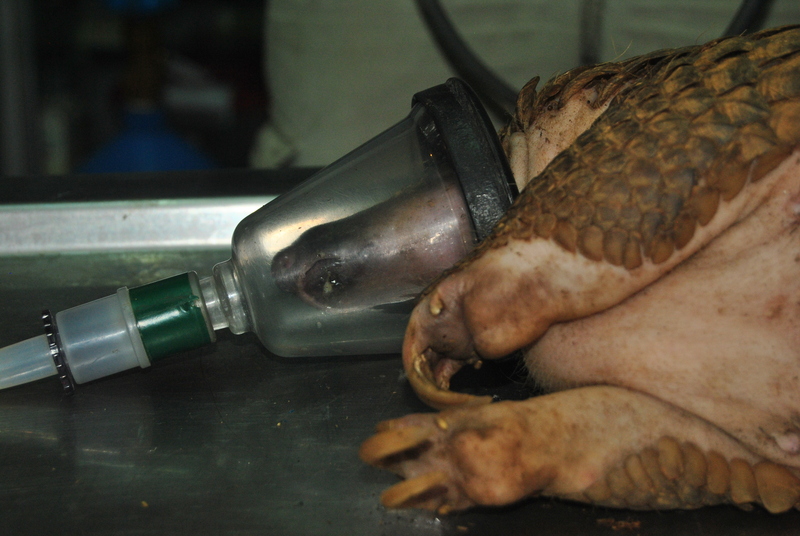 In these health checks all pangolins had blood and faecal samples taken to check for parasites. This was not only for the health of the released individuals but to ensure that their release would not have a negative impact on any wild populations. The procedure this time included anesthetising the pangolin in order to drill two holes in a selected scale, through which the transmitter could be secured. Although the transmitter looks fairly bulky on the pangolin, previous tests have indicated that they do not seem to impact on the naturalistic behaviour of the animal. Holes were also drilled into the final pangolin due for release later this year, but the transmitter was not yet attached. This will be done nearer the release date to prevent it falling off or being damages before release, but this is possible without anesthetising or sedating the individual. P34 now has over a week left in Cuc Phuong where she will be closely monitored for any signs of stress. If everything goes smoothly then she will travel down to Cat Tien National Park early next week to spend a month acclimatising to the area, before being released in the middle of August.